How do I send a card to someone that I'm making my gift in honour of? When you add an item to your cart, visit the cart page by clicking in the navigation bar at the top of the page. Click on the checkbox that says, "Add a card" and enter the recipient's name. A panel will appear below this item in the cart where you can choose to send an eCard (free) or a printed card for $3.00. A red box will appear that shows which card type you selected. If you wish, you can change your card type by clicking "Change". 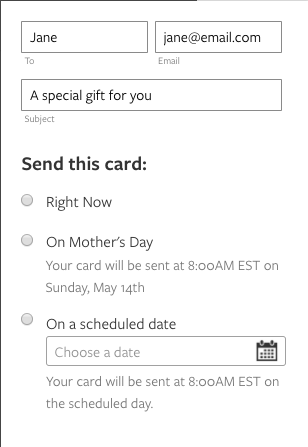 Once you complete the checkout process and pay for your gift, you will see a message that says "Don't forget to send your cards". Click the "Edit Cards" button to edit and send your card(s). When you click on the "Edit Cards" button, you will see a modal pop up with a preview of your eCard or printed card. How do I send an eCard on a scheduled day or holiday? After you complete your order, click on the "Edit Cards" button. You will see a modal pop up with a preview of your eCard or printed card. 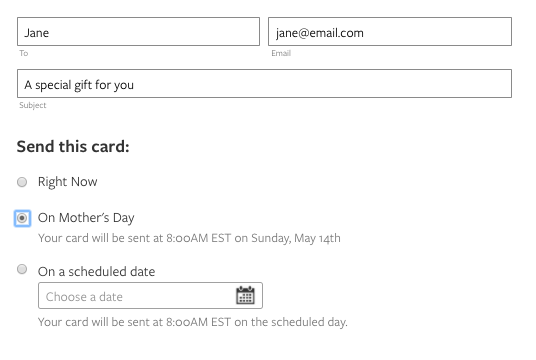 Here you can choose to send your eCard on a scheduled date. Click on the calendar icon to select a date. Your card will be sent at 8AM EST on the selected date. What do I do if I forgot to send my card? Find your order confirmation email in your inbox. The sender will be the "Warehouse | Doctors Without Borders". Click on the link at the bottom of the email that says "Click here to visit your order confirmation page"
This link will take you to the order confirmation page where you should see a message at the top of the page that says "Don't forget to send your cards". Click on "Edit Cards" to edit and send your cards. What do I do if I forgot to add a card to my order OR if the "Edit Cards" button is grey and it says there are no cards for me to send? If you are unable to edit and send your cards, please contact MSF at donorrelations@msf.ca for assistance.